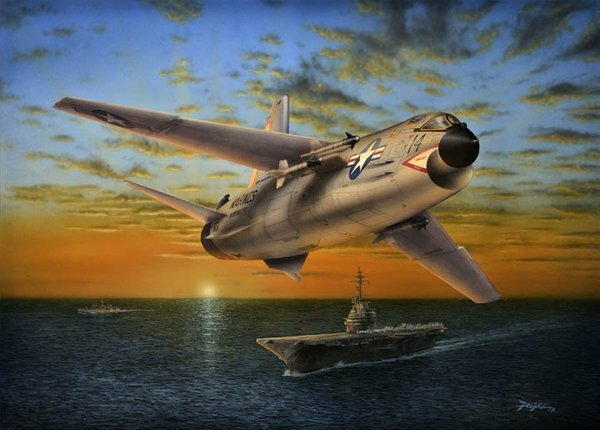 In the early 1950's the arrival of the supersonic jet age came to the US Navy in the form of the Chance Vought F-8 Crusader. The first flight of the F-8 occurred in March of 1955 and it became the first shipboard aircraft to exceed the speed of sound in level flight. In 1956 the Crusader set a world speed record with an average speed of 1,015 mph. The most unique feature of the F-8 is the variable incidence wing allowing the entire wing to act as a flap for carrier take offs and landings. By the time production ended 1,261 F-8s would be produced by Vought.